Senator Buruji Kashamu has countered the claim by former Ogun State Gov. Gbenga Daniel that the corruption charges against him is not an obstacle to his bid to be the National Chairman of PDP. The Senator representing Ogun East Senatorial District at the National Assembly, Buruji Kashamu has countered the claim by the former Ogun State Governor, Otunba Gbenga Daniel that the corruption charges against him is not an obstacle to his bid to be the National Chairman of the Peoples Democratic Party (PDP). Daniel who spoke in Abuja on Wednesday, when he went to pick his nomination form for the National Chairmanship position of the party, described his trial as persecution by the All Progressives Congress (APC)-led Federal Government. But Kashamu in a statement on Thursday said in saner climes, anyone standing trial steers clear of running for office until he is vindicated. Debunking the claim of persecution by Daniel, Kashamu said the corruption started under a PDP-led Federal Government, “so, the claim of being persecuted does not hold water”. According to him, Daniel’s claim that his trial for corruption is not an obstacle to his aspiration shows that he does not understand the seriousness attached to the position of the National Chairman of an opposition party. “For someone standing trial for stealing of public funds, bribery, fraudulent conversion of public property and false declaration of assets to claim these do not constitute a hindrance to his aspiration to lead our great party shows that he is not worthy of the high office he seeks to occupy,” he said. 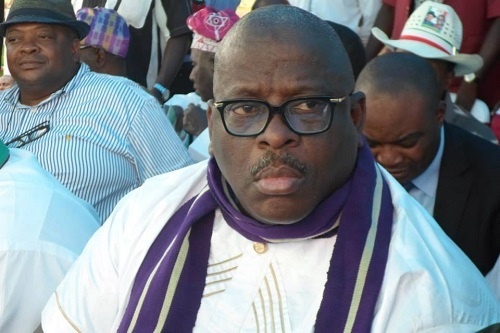 Kashamu stated that the PDP National Chairman is the face of the party, adding that, “if the party elects Daniel who is standing trial for corruption, it is indicative that it (party) condones corruption and it is for corrupt people. “This perception will adversely affect the party’s fortune. The PDP stands a chance to reinvent itself and improves its rating among the populace if it positions itself as a party that is ready to make a clean break from its sordid past,” he said. The Senator said the PDP lost the 2015 general election largely because of its perception as a corrupt party for corrupt people. “We should not repeat the mistake of 2015. This starts with electing who is not tainted by corruption charges or has an image deficit as Daniel,” Kashamu added.